Christmas season is the season when we can send someone a good cheer. I know for sure that this will bless them and brings joy to them. Today I am sharing a Christmas card using STAMPlorations stamp set and Paper Smooches. First I added the Post It stencil (or mask) on a 3.25″ x 5.5″ White Cardstock, make sure it sits in the middle of the cardstock and then I stamped them using CTMH Exclusive Inks™ Stamp Pads: Cotton Candy, Honey, Pear, Lagoon and Gypsy. I stamped the sentiment from Paper Smooches – Christmas Sampler stamp set using Pear Exclusive Inks Pad as the tree trunk. I finished the card by adding some small gold sequins I got from Hobby Lobby and a star wood chip from Frackled Fawn on top of the tree. Then final step is to add the finished panel on the card base where I had some American Crafts Glitter Ribbon on the sides. I used some thin 3D foam tape. So that is my finished glitter and sparkle tree of cups of good cheer to share with you today. Thank You for visiting and have a fabulous weekend!! I cut a piece of DCWV Glitter Cardstock Matstack that match the border color and glued on top of the commercial in the middle of it. Last step is add the finished panel on the card base. And it’s done. I love how we can be creative by turning a commercial card into a handmade card. It’s a way to recycle. Today’s card I link up at Virginia’s View Challenge #21 – All About Glitter. This is her last challenge this year and she will take a break. You can read more about it on her blog post. I know many cardmakers love her challenge. I hope you’ll join her last challenge this year and have fun! Thanks for visiting my blog today 🙂 Have a blessed day! I diecut the box out of Kraft cardstock and it is very easy to put it together (and fun!) Danielle showed how to create the box in a video here. The background papers are from Old Hymnal Book and one of CTMH retired Christmas paper packet, Sparkle and Shine. I added some Tim Holtz Vintage Photo Distress ink on the edges. I finished the card with wrapping it with White Ribbon Twine from American Crafts and a Star wood chip from Frackled Fawn. A simple card for a joyful giving this Christmas. So, do you give giftcards or prefer actual gift for Christmas? Thanks for visiting today and have wonderful day! Mixed Media is something new that I discovered among papercrafters. It is a new technique that I would like to explore and learn. According to Wikipedia, Mixed Media is a work of visual art that combines various traditionally distinct visual art media. In other word, mixed media is an art work that made by more than one medium. But Mixed Media Artwork is not the same with Multimedia Art. For example, a work on canvas that combines paint, ink, and collage could properly be called a “mixed media art, but not multimedia art. But for a start, I found couple tutorial how to make homemade Gesso and Modeling Paste. I used baby powder from Target brand and I ended up adding a little bit more acrylic paint to make it softer to mix. It was a bit hard to mix. She suggested to start with the liquid first, then the powder to avoid lump. And store the paste in air-tight container. I ended up to add a little bit more paint to make more consistency like on the video. I think what make the difference is that the brand of supplies we use. So if you wanna try this, I would suggest to start with the recipe and see if you like the result, if not then you can add more of the ingredient to make it better consistent to meet your need. The best way to store the oaste is in an air-tight container and according to them, one batch can last for 6-10 months. I did a test right away. So, I cut a tag out of Canson watercolor paper (140 lbs). To create the background, I added some Gelatos on it and blended them with my finger and then using baby wipe I blended them more to give the watercoloring look. I speeded the drying with Craft Heater. When the background tag dry completely, I added the modeling paste on it using a palete knife over Retro Circles – ARTplorations Stencil. It took a while to dry. 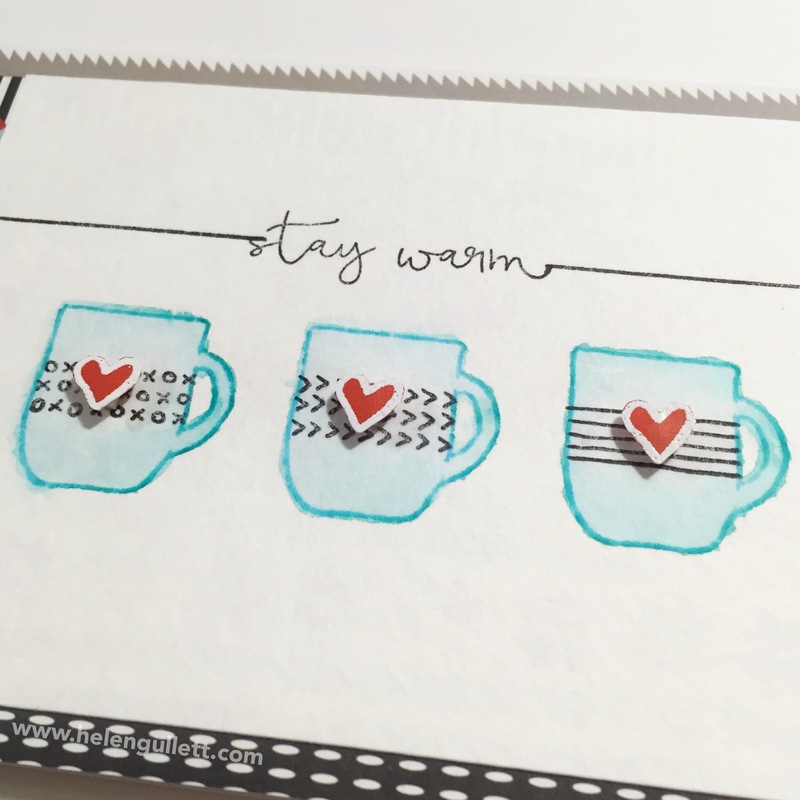 I stamped the stacking cups (Sketchy Coffee Cups – STAMPlorations) and sentiment (Literary Caffeine-anations – Big Grind by Becca Cruger, STAMPlorations) when the background completly dry. I colored and added some shadow to the cups using the Mix & Match Stamper’s Big Brushes. I love the finished tag and really enjoy the process of making it. I still have a lot to learn but this is a fun technique, making pretty mess for sure. Thank You for visiting and have a FABULOUS THANKSGIVING EVE! In the winter season, I keep myself warm enough. My favorite hot drinks are coffee, hot chocolate and green chinese tea. And it is the time to have them. On a piece of watercolor paper, I stamped the mugs from Mugs & Mittens stamp set (Concord & 9th) using Peacock Feather Mini Distress Ink. Then using slightly wet brush, I pulled the color from the lines. When they all dry completely, I stamped the decor on the mugs and sentiment from the same stamp set using Black Archival Ink. I added Snowhaven paper for the background card and then added the stamped watercolor paper on it. Then I thought it still needed something, so I heat embossed the heart with Ranger™ White Super Fine Embossing Powder and fussy cut them. I added them on the mugs with 3D foam tape. And the second card is pretty simple to make. I used the printable from Paper Issues. The pattern paper is from a fall team pad I found at Walmart. Then I added some twine with mini wooden clothespin. I give thanks for hot drinks for sure! This card I link up at Paper Issues Link & Win – Let Me Espresso My Gratitude.